Climatology does not care! The connection between two naval wars and two climatic changes within 25 years has not yet been investigated and explained. Worse! Climate science does not know to this day that during the global warming over the last 150 years the two world wars have influenced two of the most significant climatic changes in this period. Even for meteorologists of a war generation there were no obstacles to obtain knowledge about this relationship. If they had warned governments about the threat of climate change, as their successors currently do with the "greenhouse effect", naval activities in two World Wars may have been prevented, or at least been limited. They did not, and this justifies the question: Had meteorology been too ignorant and incompetent in the first half of last century? Demonstrating the effect of naval warfare is not difficult, if one recognizes the seas as the dominating climate factor, which is particularly obvious during winter seasons at higher latitudes. Naval warfare contributed to a strong Northern Hemispheric warming phase (1919-1939), and a global cooling phase (1940-1975), at least partially. The starting points are the three extremely cold war winters of 1939/40, 1940/41 and 1941/42 in northern Europe . Had they happened without the war at sea? No! To prove this, the study used more than four-fifths of the available book space as evidence. The result is convincing. The three extreme winters are anthropogenic. The medium is the sea. This justifies, assuming a link with a global cooling since 1940 for three decades. Naval warfare impact in WWII has been confirmed concerning air winter temperatures in Europe . The available material is sufficient enough. Especially helpful are 14 temperature maps, which are reproduced in color, and are available digital. All data show: The world was warm, just Europe froze. It is shown that a cold corridor extends from the west coast of England , via North Sea and Baltic towards the Ural. This applies to all three winters, but is especially elaborated for the first war winter 1939/40 (pp. 43-104). This winter was a complete surprise to all contemporaries, and any deviation is based on observations from periods without human military interference with the marine environment. Evidential circumstances can be also drawn from the sea ice development in the North Sea and Baltic, which received their first full-icing since 1883. It is getting sensational if one adds the air temperatures and sea ice cover of the initial three war winters and is looking for comparable periods. They do not seem to exist. Their absence confirms this thesis. That these three extreme winters were not repeated between 1943 and 1945 can be explained by the fact that naval war went global after the attack on Pearl Harbor in December 1941, and that war activities at sea happened across the Atlantic and the Western Pacific. With the relocation of naval warfare from Europe into the oceans of the Northern Hemisphere, the consolidation of global cooling began, which statistically commenced with the extreme winter 1939/40. In return, it is evident in temperature data at many of the Atlantic locations. In a recent study by Thompson (et al., 2010) only a late phase of global cooling around 1970, is attributed to lower water temperatures in the North Atlantic . The authors have spent no word on possible contributions during 5 years of naval war in the Atlantic . They ignore, as other climate scientists have, the role of the Atlantic for the change to a cold phase from 1940 onwards. Also in the northern Pacific, there was an abrupt change in surface temperatures, after amassing colossal war machineries between Hawaii and the Asian continent from December 1941 to August 1945. A change in the attributes of warm and cold water, known as "Pacific Decadal Oscillation", began in 1943. Since this phenomenon has been in place only two times in the last century, a contribution by the Pacific War is also indicated. This is supported by the very cold winter of 1944-45 in Japan, as well as by low temperatures in the following summer months, when naval warfare came closer and closer to Japan’s shores. 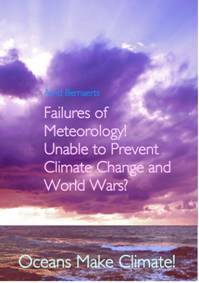 Meteorology could have foreseen these developments, if they had ever undertaken attempts to analyze the weather and climate development during the First World War, and after the surprising extreme WWII winters. At the latest, when it became known, that winter temperatures had rapidly increased at Spitsbergen since 1918/19, time had come to analyze the effect of naval warfare on weather conditions in Europe, on the sea areas in Western Europe and their connection to the Norway and West Spitsbergen Currents. But neither for example an exceptional snow incident in England over three successive winters, nor the increasing sea ice cover in the Baltic (see Ref: Drummond and Oestman, A1, p. 2), or the cold winter 1916/17 in Western Europe, neither the extreme sea ice in the Nordic Sea during summer 1917, etc, were taken into consideration. How is it possible that massive naval wars have been ignored as contributors to the potential of anthropogenic climate change? Thus, meteorologists have failed to gain the competence which would have enabled them to warn about possible consequences of a second world war. The consequences are inadequately described, with the word, ‘tragic'. The tragedy continues: Even after 90 respectively 70 years, none of the issues raised have been picked up by climatology and were never answered or elaborated. Instead, it is suggested to the public and politics that the climate system and anthropogenic influences, with reference to the greenhouse effect, is well understood. www.seaclimate.com; Overview of the 14 color maps on page: v; and page: 211. "Oceanography for Meteorologists", New York 1942, page 223.